Gund Yellow Labrador Beanbag: Inspired by real Yellow Labs, this puppy is adorably soft, cute and huggable. all in one puppy package! You'll notice extra two-toned color details on his ears and paws for added realism. And at about 8 long from nose to hind paw. he's easy to take with you everywhere! Handcrafted European style lifelike stuffed plush standing Yellow Labrador Puppy from Hansa. 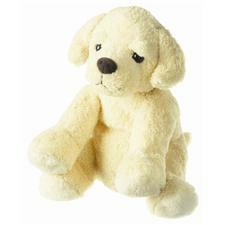 Handcrafted European style lifelike stuffed plush sitting Yellow Labrador Puppy from Hansa. A soft and fun savings bank within a beautiful stuffed plush yellow lab from Jaag Plush. Find Plush Yellow Labs for bid at Ebay.